Baba Ganoush: Don’t underestimate the Eggplant! 5 easy ways to enjoy this summer vegetable. Surprise, it’s actually a fruit! Although we mostly know it as the purple strange looking, pear shaped vegetable, eggplants can vary from any shade of black to almost white! 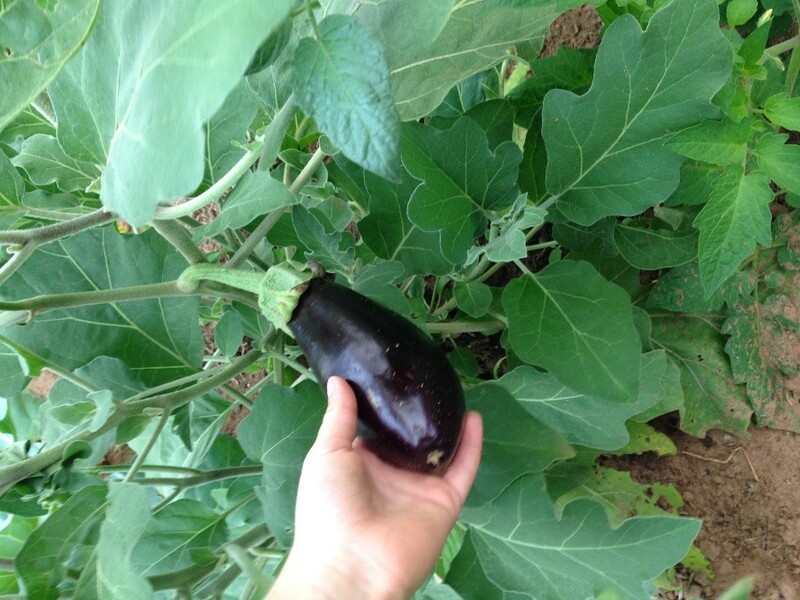 When picking eggplant at the store look for the ones with the length of a cucumber and the circumference of an apple or pear. The larger ones tend to have more seeds and be a bit bitter. They can’t be consumed raw because it contains a toxin, solamine, which can cause gastrointestinal problems when uncooked. They also don’t need to be stored in the refrigerator, they are a summer “vegetable” after all. Eggplants are a phenomenal source of fiber as well as several phytonutrients. They contain an impressive array of many minerals and vitamins including folate, potassium, manganese, vitamins C, K, B6, niacin, thiamin, phosphorus, copper and magnesium. The whole plant can be used, the leaves and roots are juiced or even boiled in some cultures to relieve stomach troubles and inflammation. Their dark purple skin is where you’ll find their most powerful antioxidants. These antioxidants are crucial for reducing free radicals in the body and protecting cell membranes from damage, which explains eggplants protective qualities against heart disease and cancer. Grilled: This is your easiest way to enjoy eggplants. Just wash it well and slice it medium thick, brush both sides with extra virgin olive oil and sprinkle some salt and pepper. Grill 7-9 minutes on each side. Try it as a topping for your turkey burgers, or forget the buns and use the eggplant instead! Baked: No time to go outdoors, no worries. Just turn up your oven to about 450F, wash your eggplant well, prick with a fork a few times around, place in baking sheet and bake for 20 minutes. You may also slice it up first, brush with olive oil and sprinkle some salt, pepper and garlic. They make great “noodles” for a vegetable lasagna! Boiled: Wash eggplant well, you may peel or leave the skin on. Cut it up into chunks and place in pot with about twice as much water as eggplant. Bring it to a boil then lower to simmer and cook for about 10 minutes or until eggplant soft. This method is great for adding the chucks to a dip or for serving it as a side dish. Just season with olive oil and fresh herbs. Pan seared: Wash eggplant and slice it making about 0.5 inch thick slices. Then drizzle a pan with olive oil, turn to medium heat and pan sear your eggplant until soft and golden brown on both sides. They are a great side item to a summer barbecue, or make a great appetizer too! After cooked just place them in a paper towel to reduce the moisture, sprinkle some cheese and serve them on a multigrain cracker. Pureed: You can be as creative as you’d like to be here. After roasting it in the oven at 450F for about 20 minutes the center is soft and can be scooped out with a spoon. That soft center is the perfect dip ingredient when added to a food processor. 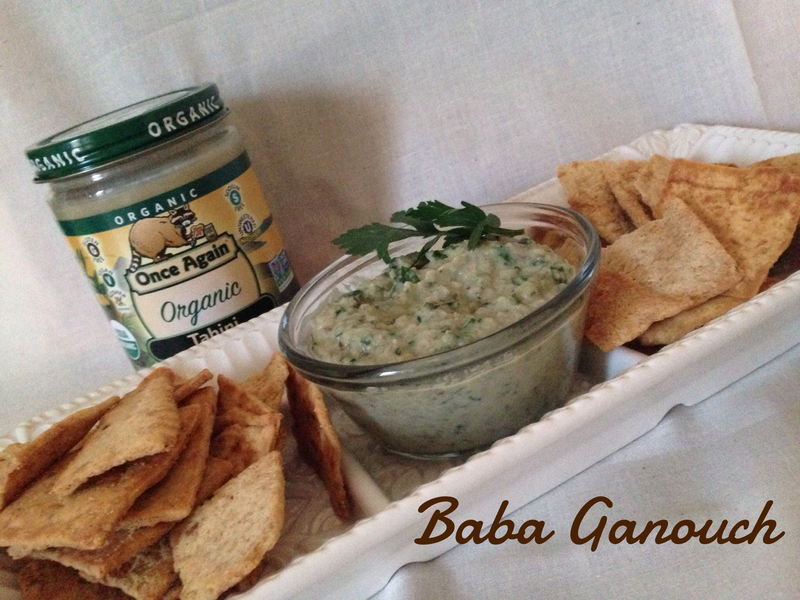 A traditional Mediterranean dip called: Baba Ganoush is simple to make and has a delightful earthy taste that goes so well with pita chips. Check out the recipe below. Wash eggplant well, prick with fork and place in 450F oven to bake for about 20 minutes. Slice it in half and scoop out the center with a spoon. Allow it to cool and place it in food processor until you have a smooth puree. Now add the salt, garlic, lemon juice and mix well. The last ingredient to add is the Tahini which gives it the perfect texture and flavor. Enjoy it fresh or place in refrigerator to store. Perfect as dip for pita chips, or try a dollop on top of a Greek burger! Funny fact about eggplants: ancient Mediterranean people nicknamed it “mad apple” believing that eating eggplant every day for one month would lead to insanity. Mix Sunflower Seed Butter with melted butter and banana until well mixed. 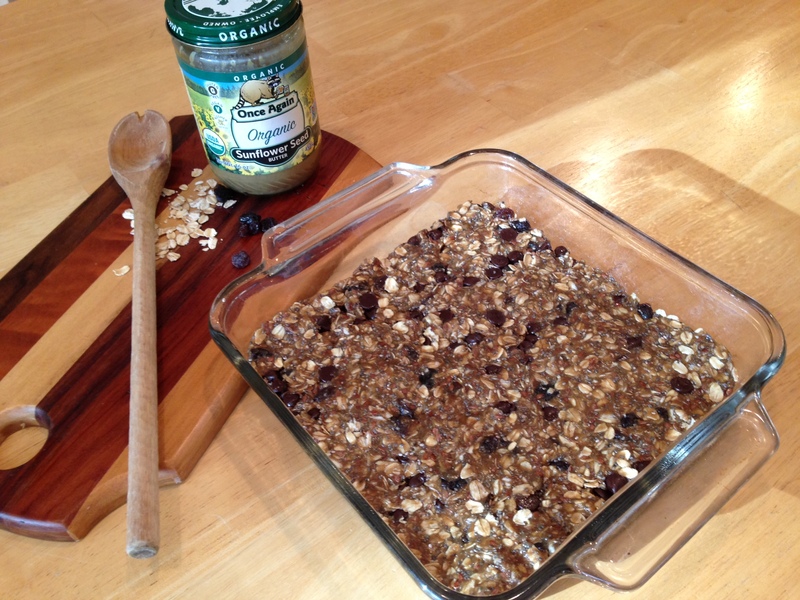 Then add the oats, seeds and dried fruits. Lastly fold in the dark chocolate chips. Preheat oven to 350 degrees and spray a 8×8 inch baking pan with non-stick cooking spray. Spread mixture in baking pan and bake for 30 – 35 minutes or until golden brown. Once cooled, cut into squares and you can keep it in the refrigerator for 7-8 days. 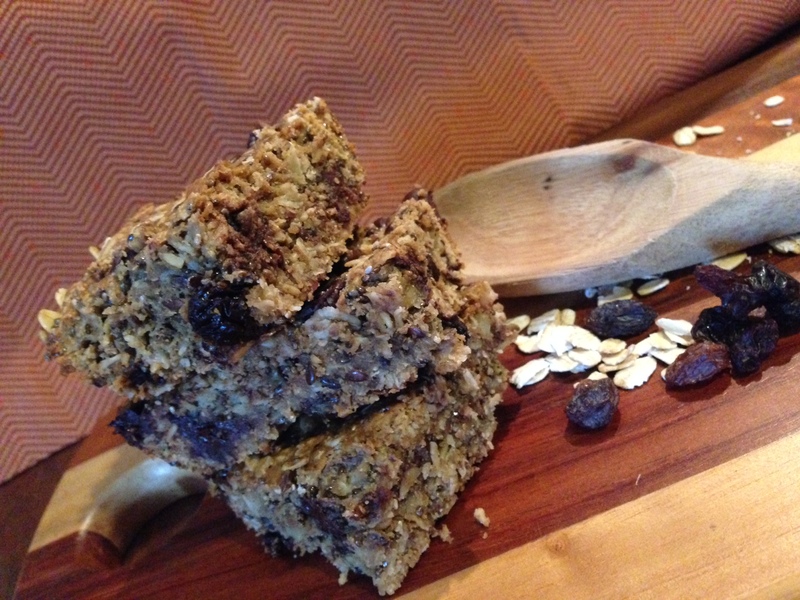 Note: if you use Gluten free oats, this bar will also be gluten free! And it is nut free as well.